Here you'll find mother birthday poems. These original, rhyming mom birthday poems say Happy Birthday Mom! Choose the poem for Mom's birthday that you like best. The following mom birthday poem is sure to make her feel special. This mother birthday poem acknowledges how hard mothers work to make family life better. This free mother birthday poem describes an extraordinary mother. It’s a special free verse poem for mom’s birthday, a mom birthday poem she will treasure always. created so much good in my life! an unselfish person of good character. lifting me when I fall. Mother birthday poems can acknowledge the things mom did for you. This poem for mom's birthday does that. Mother birthday poems often express heartfelt feelings. This mom birthday poem tells how much mom means. Mother poetry can be in the form of a prayer for mom. This mother birthday message asks the Lord for good things for Mom. My mother cared for me. With great wisdom, love and charm. Here's a simple mom birthday poem that will convey your love. Because, Mom, I love you! 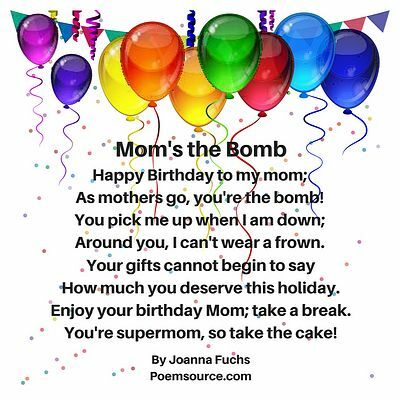 Mother birthday poems should show appreciation for all that mom contributes, as this happy birthday mom poem does. Mother birthday poems should send messages that touch mom's heart. Can a mother birthday poem say anything better than "I want to be like you, Mom"? A mother like the one I want to be. Mother birthday poems often laud mom's dedication to her family as this mom birthday poem does. And everything we all hold so dear. Mother birthday poetry should express to Mom how much she means to you. This free verse poem for moms birthday acknowledges the comfort and security she gives you. It's a happy birthday mother poem she'll treasure. You are always there for me, Mom. Well, I didn't realize I already had a birthday prayer for mom on this page, and I wrote another one, a mother birthday poem that asks for blessings for her. Asking Him to bless you in every way. Because you’ll own my heart eternally. Who gives so much; she’s unlike any other. Love her, Lord; my mom, whom I adore. on our Mother Poems page.